Guests of the Flaglers entered Whitehall through large bronze doors decorated with lions' heads and flanked by uniformed young doormen on duty 24 hours a day. Once inside, guests found themselves in a massive room complete with a grand double staircase leading to the second floor. At the time, it was customary for a home's architect to design the entryway and the grand staircase, leaving the look of all other rooms to an interior design firm. This was the case at Whitehall. Carrère and Hastings designed the entryway to be the largest and grandest of any room in a private home built during the Gilded Age. To the visitor, the Grand Hall might seem smaller than its impressive 5,000 square feet. But, this is exactly what Flagler intended when he asked Carrère and Hastings to drop the ceiling eight feet below what was originally designed in order to give the room a more intimate feel. Seven varieties of marble were used in creating the floor, walls, stairs, furniture, and sculpture for the Grand Hall. The deep green marble table in the south end of the Grand Hall was created especially for this room by Pottier and Stymus of verdestella marble from Russia. Atop this table sits a bust of Caesar Augustus, a nineteenth-century copy of an original full-size bronze sculpture. 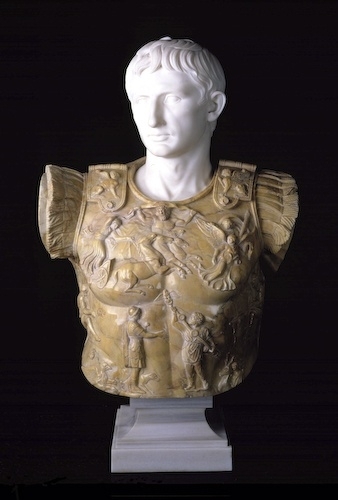 The original statue was made to celebrate Caesar’s victory over the Parthians in 20 BC and the breastplate identifies Caesar with Apollo (the patron of the Muses), his sister Diana, and Aurora and Luna. The selection of this bust to adorn the Grand Hall was intentional, for it signaled the nineteenth-century American interest in ancient Rome as a prototype for the great society America seemed to be becoming. Gilded Age individuals, such as Henry Flagler, saw America as the natural culmination of an evolving Western civilization. The Grand Hall’s ceiling is highly decorated with plaster figures and objects. The ceiling’s central dome depicts Pythia, the priestess of the Oracle of Apollo at Delphi. The painting was done on canvas and then fitted into the ceiling space. Two paintings flank the central dome, depicting Aurora (morning) to the north and Luna (evening) to the south. Near the southern alcove is a rosewood and bronze clock with cabinetry made by François Linke. The Louis XV-style clock was made by Linke and shown at the 1900 Paris Exposition. An elaborate clock like this seemed the perfect union of beauty and precision technology. Behind the green marble table is a large cassone, or hope chest, incorporating a panel painting of the Adimari family wedding. This cassone is nearly identical to the one that originally graced the Grand Hall, but was unfortunately destroyed some time after Whitehall became a hotel. Both the cassone originally in the Grand Hall and the one there now, are nineteenth-century reproductions featuring a painting from an Italian Renaissance cassone panel in the collection of the Galleria Accademia in Florence, Italy, and brought to the attention of Americans by art historian Bernard Berenson in the nineteenth century. At opposite ends of the Grand Hall are portraits of Henry Flagler, painted in 1899, and his granddaughter, Jean Flagler Matthews, the founder of the Flagler Museum, painted at the Museum in 1964. The Cassone, with a Renaissance-style panel painting, at the south end of the Grand Hall. The Grand Hall's central dome depicts Pythia, the priestess of the Oracle of Apollo at Delphi. A rosewood and bronze clock with cabinetry made by François Linke. The Louis XV-style clock was made by Linke and shown at the 1900 Paris Exposition. Portraits of Henry Flagler, painted in 1899 by society painter, Raimundo de Madrazo y Garreta, Flagler's portrait depicts him with the heel of his right hand resting on a Louis XV table with an open ledger book and stack of literary books behind. Unique marble statues of Greek Muses are in the four corners of the Grand Hall. A portrait of Jean Flagler Matthews, Henry Flagler’s granddaughter and the founder of the Flagler Museum, hangs at the north end of the Grand Hall.